Import Charvel | The Resource for Charvel Import Guitars with Japanese Charvel Fort Worth Texas Era Plate! So you ask how can I identify my Japanese made Charvel guitar. Well thats a good question. So far as we know, the best way to try to identify when your import Charvel was made is to know the details of the different phases of manufacturing. The other aspects, like if its a Charvel Model one or a Charvel Model 2, can be distinguished from the old catologs that exist. To some of you shredders the guitar you hold in your hands might be older than you are. For those of us that lived in the 80s that Charvel probably keeps alive memories of a big hair, hot chicks and a rebelious youth. That said It can be difficult to pinpoint when your Import Charvel was manufactured since these Charvels were made in Japan in the 1980s. We live in what is to these guitars the future. Needless to say not many of us have been lucky enough to have visited Japan and even fewer of us Im sure have ever been to Nagano City, Nagano Prefecture, Japan where the Chu Shin Gakki manufacturing plant is said to have turned out these Charvel Import Guitars. Not much has come out in the way of real information, facts, or even rumor in regards to these made in Japan Charvel Imports. Japanese Charvels serial numbers lists, anything in writing or verifiable, and manufacturing data is virtually non-existant. This page is a best effort at putting out there the tangible differences that have been seen in these "vintage" guitars. If you have more information, preferably tangible ( hard evidence ) or at least logically realistic facts please send an email and offer it. There are many clues to follow. If you've owned a number of Japan made Charvels you have noticed things. To start the body and bridge details reveal some facts about the make and year of manufacture for these Japanese Charvels. A majority of charvels left the factory in Japan with a kahler 2500 series bridge in black, If you have a Kahler 2500 series on your Charvel it most likely has a neck plate with a serial number some where between 220000 and 250000. If you have a made in Japan Charvel with a 2500 series Kahler on it and it has brass rollers on the saddles like the one pictured here it most likely would have an even lower serial number. This is one indicator that the Charvel would have left the Japanese manufacturing plant in 1985 or 1986. A Charvel with a 2500 Series Kahler bridge would be from the 1986 Model Line UP. It is said that the serial numbers for Import Charvels started at 220000 for the 1986 product line. Japanese Charvels with the Kahler 2500 bridge mounted with a very low serial number, say 220000-240000, would have these SMALLER brass bushings and post type like the ones pictured above. Later Kahler 2500 series trems had wider brass body bushings. Even further down in the first run the brass saddle rollers on the 2500 series Kahler bridge were switched out to black steel saddle rollers. Probably due to Kahler Manufacturing. The Kahler¨ 2300 series CAM-OPERATED TREMOLO BRIDGE SYSTEM is often referred to as the original Kahler system.This bridge was also offered in the early 1986 series prior to Import Charvels moving to a Licensed Floyd Rose bridge. A Charvel with a 2300 Series Kahler bridge would be from the 1986 Model Line UP. If this unit is on your guitar that would positively date it to 1987 or later. There are lots of bridge systems out there and without giving a big history lesson here let me just say that in the early-mid 1980s everyone wanted to use a Floyd Rose tremolo.This was inspired by Eddie Van Halen and Mr Floyd Rose through the invention of the Floyd Rose Tremolo. In the above photo I have seperated the string lock block from the fine tuner. As you can see the section comes apart and the "block" has a larger square shaped top. This fine tuner set up and the block work together to hold the string, after its been cut, into the bridge. If you've ever seen an Original Floyd Rose trem you will quickly be able to tell this difference. The JT-6 trem is NOT an "Original Floyd Rose". By 1987 Mr. Floyd Rose licenced to other companies the ability to manufacture "copies or bridges similiar to " his Patented tremolo system. Jackson Guitars obviously had a license agreement with Floyd Rose to produce this tremolo for thier guitars. That make the JT-6 trem a licenced Floyd Rose Trem. In my opinion the introduction of this came about out of urgency. 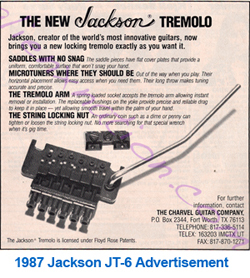 Had Charvel Jackson not offered a Floyd Rose type system, due to the popularity of this type of bridge peaking in and about 1987, Im sure Jackson and Charvel sales would have suffered DRAMATICALLY.